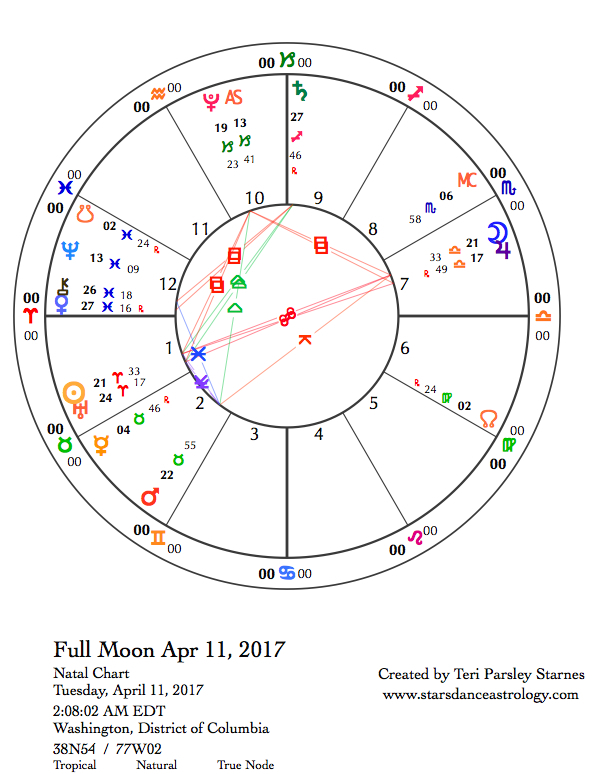 April 11—Full Moon in Libra: Blossoming. This lunation I am noticing my awakenings. Aries seeds were planted on March 27 at the New Moon. This first sign of the zodiac is about coming out of sleep to leap back into life. I find myself, halfway through the lunar cycle, with a desire to think about awakening in a new way. That is what I love about following an intention through the Moon cycle—this opportunity to dig deeper into an inquiry, to uproot some of my compulsions, and to dismantle some of my assumptions. Each phase of the Moon has me looking again at my focus and reflecting on how it fits into the moment. How might I change my perspective and realize something new? “According to the Buddhist tradition, the spiritual path is the process of cutting through our confusion, of uncovering the awakened state of mind. When the awakened state of mind is crowded in by ego and its attendant paranoia, it takes on the character of an underlying instinct. So it is not a matter of building up the awakened state of mind, but rather of burning out the confusions which obstruct it. In the process of burning out these confusions, we discover enlightenment. If the process were otherwise, the awakened state of mind would be a product, dependent upon cause and effect and therefore liable to dissolution.” – Sakyong Mipham Rinpoche’s forward to Cutting Through Spiritual Materialism by Chögyam Trungpa. If ego’s function is “to maintain the sense of a solid, continuous self” (Sakyong Mipham Rinpoche), then the question becomes what is the conflict between identity (Self) and waking? Why would the Self resist waking up? What feels threatening to the ego? What are the benefits of waking, anyway? I know that a solid sense of self is useful. A healthy ego is necessary. Yet, there are limitations, too, when we isolate in Self alone. It seems to me that this isolation has created a lot of the problems we currently face. Ego-defended isolation means I am not in relationship. When I am not in relationship, I lose touch with the things that make life beautiful and sacred— the relationships between all beings, both visible and invisible. Such relationships keep egos in check and make the possibility of waking a perpetual dance of interaction with others. Such relationships can be scary. Needing others feels vulnerable. Letting my ego defense down exposes me to change. That solid sense of self that feels so safe suddenly is threatened by another giving me feedback or asking me to be different than I am. Yet, without such vulnerability, I cannot be fully awake in this life. This is the paradox and possibility of the Full Moon in Libra, which occurs on April 11. Libra is about Relationship in equal proportion to how much Aries is about Self. These signs oppose each other and create a challenge for us. How do we balance self and other? How do we wake from isolation into relationship? These questions are potent right now, not just because the Sun and Moon occupy Aries and Libra. Uranus in Aries and Jupiter in Libra have ratcheted up the tension quite a bit since coming into opposition in December 2016. This Full Moon could feel like a culmination of the lessons we are learning about waking up to and in relationship. And it could be dramatic. The Sun, Uranus, and Eris conjoin in Aries the week after the Full Moon. Eris is a dwarf planet located on the distant edges of our solar system. The discovery of Eris in 2005 led to the reclassification of Pluto to dwarf planet status. In myth, Eris is the goddess of strife and discord. The dwarf planet, Eris, is aptly named. Pluto’s declassification caused a bit of discord when Eris came on the scene. This week we will notice more discord. Make no mistake, awakenings may feel very uncomfortable right now. Jupiter in Libra opposes Sun, Uranus, and Eris. Jupiter makes the choice to let down our ego defenses a little more palatable. Jupiter in Libra encourages the risk of needing others. Pluto in Capricorn squares this opposition between self and others, adding the potential for powerful and deep transformation, the kind of transformation that changes everything. Spring weather can be tempermental, one moment calm and serene, the next moment a storm is blowing through. Transits for the week of the Full Moon feel like that too. On the calm and serene front, Mars in Taurus aims for stability, but makes a quincunx to the Moon in Libra in the Full Moon chart. Not everything is under control. Retrograding Venus has returned to peace-loving Pisces from a tempestuous foray into Aries. Venus stations direct on April 15 and will re-enter Aries on April 29, giving us another opportunity to awaken to vulnerable relationship. The last week of this lunar cycle feels more muscular, with earthy energies being emphasized. The Sun in Aries trines Saturn in Sagittarius helping us to anchor to our intentions. 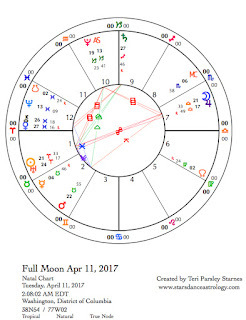 The Sun enters fixed earth Taurus on April 19, and though a week remains in the Aries lunar cycle, we begin to settle a bit. Much of the anxiety of spring emergence is over. Now, we tend the gardens. Pluto will be stationing retrograde on April 20, which always feels to me like the Earth reasserting life force power. We are small in relation to the Earth and we are reminded of it. Wednesday, April 12. Scorpio has a reputation for being ruthless. This reputation is only partly deserved, but today we might see why Scorpio occasionally needs to use stinger and claws. The Moon in Scorpio has us feeling ready to strike out in defense. The Sun in Aries conjoins the dwarf planet Eris, goddess of discord, today. Uranus, the planet of awakening, is nearby, only one degree away. Aries can be pretty defensive too. Mars rules both Aries and Scorpio. The day starts with the Moon opposing newly retrograde Mercury in Taurus. Communication is problematic. Add to this a less than peaceful influence from Sun, Uranus and Eris, it may be best to reflect on why we feel so defensive and whether we can soften hard ego stances that keep us from trusting others. Thursday, April 13. Unsettled spring energy disturbs complacency and the ways we may be sleepwalking through life. Just after midnight tonight, the Sun in Aries conjoins Uranus. Earlier, the Moon in Scorpio opposes Mars in Taurus. What if we welcomed experiences that ask us to question our defended sense of self? What if were willing to let old constructs crumble, much like the image in the Tarot of the Tower being struck by lightening? Lightening may strike today. The Tarot teaches us that only after unhealthy structures are allowed to fall can we experience the integration and wholeness offered in the following card, The Star. Not everything is lost in the transformation. What remains are the building blocks of better relationships. As the Moon trines stationary Venus in Pisces, we may learn important ways to strengthen our relationship when we use empathy to make connections. Friday, April 14. Sometimes we expect too much of ourselves. Notice how that may be true for you right now. Uranus and the Sun conjoin in Aries. Mercury is retrograding through Taurus heading back to Aries. Venus is stationing direct in Pisces heading back to Aries. Does it seem like everything is trying to tell you something about waking up? Does it seem like everything is trying to get you to see the ways your ego may be keeping you from that awakening? We might be craving stability and not finding it in too many places. Or, under the influence of the Sagittarius Moon, we might feel that hitting the road is the best way to find some kind of normal. We can’t run from ourselves. All this emphasis on Aries must be telling us that at the very least. Ride the waves of change. Be the change you wish to see. April 15—Disseminating Moon: Fruiting. Did something grow from the seeds you planted in the New Moon soil of Aries (March 27)? What happened during this cycle of awakening? What were the struggles? What are the gifts? Given the rambunctious nature of this lunar cycle, these gifts were probably unexpected and most likely a mixed bag. I’ve learned it isn’t easy to wake up. What feels like a joyful desire to shed winter’s drudgery can actually be scary and confusing. I’ve also learned about ego resistance to becoming truly awake. It has felt to me like flying without a net. Aries energy is much like the Fool’s in Tarot. The Fool is often depicted as someone about to take their next step off a cliff, totally unaware that it is about to happen. Is this awakening or a result of being asleep? Whichever, it seems that life conspires to push us further, willingly or not. What are you noticing? The Sagittarius Moon invites the Fool’s adventure. Both Aries and Sagittarius are fire signs. Both lead to discovery of Self. Venus stations direct today after turning retrograde in Aries on March 4. This planet of relationship has been challenging the notion of selfhood. Venus, which usually helps us to moderate our tempers, has displayed much less impulse control while retrograding through Aries. Today, Venus stands again in Pisces, readying to reenter Aries on April 29. How will we commit to a better balance between Self and Other? Sunday, April 16. This is a good day to pause and take stock of where you are now after a very active and stimulating week. Maybe there was so much stimulation that you needed to shut down. That happens. Chiron, the Wounded Healer, is influential today. Yesterday, Venus in Pisces stationed direct a few minutes from an exact conjunction with Chiron in Pisces. Mars in Taurus makes a sextile aspect to both Chiron and Venus. The pausing moment asks us to look at our fragility. Vulnerability is not a sign of weakness. But there is something we can learn about habitual states of fragility. Those don’t help either. I am thinking of this recent Venus retrograde as an opportunity to scrub clean some unproductive assumptions about getting along with others. There are times to stand up for yourself and times you need to step aside. Have you learned this discernment over the past month? Mars in Taurus provides a steady ground to stand on as we as we consider these lessons. Monday, April 17. If fire makes the engine go then earth provides the brakes. Earth emphasis today helps us slow down. Not everything can be solved, initiated, or dealt with immediately. Notice the way that earth helps you reconsider rash moves and provides good boundaries for processes moving way to fast. The Sun in Aries is trine to Saturn in Sagittarius. Though both of these signs are fire, the action of the trine between the Sun and Saturn feels earthy. Mars in Taurus, which is an earth sign, asks Saturn to act more Saturnian, which means determined and focused. The Capricorn Moon, ruled by Saturn, values integrity. Following through on commitments feels good. Venus in Pisces is moving slowly after stationing direct two days ago. This slow moving Venus is building to an exact square to Saturn on April 21. Lessons learned about relationship begin to form new commitments. The process isn’t easy. Be patient. Tuesday, April 18. If the Moon is in a cardinal sign (it is) then it must be time to reactivate the querulous planets: Uranus in Aries opposing Jupiter in Libra, with both forming a square to Pluto in Capricorn. This t-square pattern is moving off of exactitude but the Moon helps remind us of the tensions below the surface of daily life. Issues of change, justice, and power collide again. They may be colliding but perhaps they are also reminding us that we can’t rest while so much is at stake. What helps you sustain the effort? April 19—Last Quarter Moon: Re-seeding. Sun enters Taurus. The last week of the Aries lunar cycle begins just as the Sun enters Taurus. The flavor of this cycle has just changed, but not by much. Aries is bubbling under the calm surface of grounded Taurus. Later this month when Mercury and Venus re-enter Aries, we will feel again that surge to awake and act. Now, however, we are in the mood to evaluate our experiences of the last three weeks. Sometimes we can’t take back our actions. Perhaps you’ve wanted to. Aries often acts first and thinks second. This can lead to regrets. Do you have any? Though we may not be able to take back such actions, we can learn from them. My own regrets led me to explore the relationship between ego and awakening. Buddhist teacher, Sakyong Mipham Rinpoche, writes that “it is not a matter of building up the awakened state of mind, but rather of burning out the confusions which obstruct it.” Mistakes can be the catalyst to burn away unnecessary obstructions to relationship. Perhaps I have learned I do not need the ego defenses that keep me isolated. We are learning, even if we have a hard time expressing it. The Moon in Aquarius makes a challenging square to retrograde Mercury in Taurus. The Aquarius influence increases the speed of thought. The Taurus influence asks us to slow it all down. Don’t trip over yourself trying to get your message across. Everything in the mercurial realms: electricity, travel, communications, commerce do not behave as they should. Thursday, April 20. The inferior conjunction—the moment retrograding Mercury conjoins the Sun—is the heart of the Mercury retrograde cycle. That happens today at zero degrees Taurus. Taurus appreciates the basics. Perhaps we can simplify the way we think, the words we use, our means of getting where we want to go. Perhaps, we can re-evaluate today the ways our thoughts impact our everyday lives. Slowing down is suggested. That way, we can better appreciate the reverberations of Pluto turning retrograde today. As ruler of the underworld, Pluto impacts the deeper realms of Earth. Notice the Earth. Spend time listening. You just may hear the Earth’s soul speaking to you. Friday, April 21. The Sun and retrograding Mercury have passed each other like two ships in the night. Now, the Sun moves deeper into Taurus and Mercury moves back into Aries. The Aries lunar cycle is winding down. Retrograding Mercury invites us to open in a different way to the intention of awakening. Open your senses. Expect to get messages. There’s another helper with messaging. Mars has entered the mercurial sign of Gemini. How many ways can we communicate? How can we awaken curiosity? How might this change our perspective? Another significant influence is Venus in Pisces (still retrograde) forming a square to Saturn in Sagittarius. All week, these two have been in dialog about mutual supports, the necessity to rely on each other, even when we don’t know how. There is pressure to make our relationships more meaningful. Ironically, this may leave us forgetting how to be social. As sensitivity increases under the Pisces Moon, focus on the quality of your relationships and cull the ones that don’t feel right to you. April 22—Balsamic Moon: Composting. The end of a journey can feel like the beginning. Coming to the final phase of this lunar cycle planted with the Aries seeds of awakening, we might wonder if we’ve even been anywhere at all. I’ve noticed that the intention of awakening started with a desire to bring new light to self-reflection, went off in the direction of spiritual awakenings, and now comes back to the question: What is waking? What does it mean to wake up? What is waking in me right now? What is waking in us? The Moon in Pisces invites surrender. This may even feel like relaxing vigilance. Perhaps waking happens naturally. We don’t have to force it. It doesn’t take effort. I want to notice what is waking in the Earth right now. What do creatures show me about waking? Waking is relationship. When the Sun reaches a certain latitude, buds know to emerge. When the rain comes, grass begins to green. When insects start to hatch, birds know to show up. My waking depends on so many seen and unseen things. As I acknowledge the interconnections, I honor the mysteries of mutual awakenings. Transits are relatively quiet today. Go outside. Notice what is waking. Sunday, April 23. Before moving into Aries tonight, the Moon in Pisces visits Chiron and Venus in Pisces. Saturn in Sagittarius looms in the corner making sure we don’t enjoy ourselves too much. Pisces influence creates identification with the suffering of all beings. Saturn influence says we must do something about it, or perhaps we feel overwhelmed by not being able to do anything about it. Take one step at a time. It is beautiful that we feel so much. Monday, April 24. We’ve got something to go over again today. Retrograding Mercury in Aries forms a trine to Saturn in Sagittarius. These two made the same contact on March 29 when Mercury was moving direct. After Mercury stations direct, it comes back for one last chat with Saturn (May 11). We are honing our communication skills. Think of today as the second draft of an important letter. What do you really want to say? Aries fire might make it hard to slow down enough to consider our second thoughts. Notice that. Tuesday, April 25. On the last day of the Aries lunar cycle, the Moon returns to meet Uranus in Aries once again. This time, retrograde Mercury is there too. What have we learned about awakening? Sometimes the lightening does it for us. Today might be one of those days. Be careful with communication and travel. Yesterday, perhaps you practiced having second thoughts. It might be good to remember how to slow down the speed of yours. If you are feeling brave, or foolish, you might want to ride the wild ride of this day into unexpected circumstances. Who knows, it could be delightful.